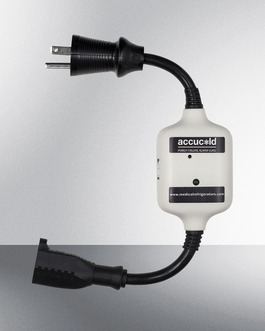 Accucold's PF1Kit is a power-out alarm designed to audibly warn users in the event of a power failure. Simply plug your own electrical device into the PF1 receptacle, and plug the grounded three-wire 15 amp PF1 cord into your wall outlet. If your unit loses power, the battery-powered alarm will sound at an 80 dB noise level for up to 90 minutes. A built-in switch allows you to silence the alarm. The PF1 includes a hospital grade cord with a 'green dot' plug to ensure it remains securely plugged into your wall outlet. You can order this option with your Summit or Accucold unit, or use it for virtually any brand of 115/120V appliance up to 15 amps.